Savannah has survived devastating fires, powerful hurricanes, rampant epidemics, several wars and destructive insects to become one of America's most beautiful cities. Georgia's first city, Savannah was established in 1733, west of where the river of the same name meets the Atlantic Ocean, by Gen. James Oglethorpe. The colony of Georgia, the last of the original 13, was a haven for England's working poor, who flocked to the New World looking for a new start. Under the colony's original charter, rum, lawyers and slavery were forbidden, at least for a while. Oglethorpe designed America's first planned city with wide-open streets and shady public squares and parks, and 21 of Savannah's original 24 squares are still around. Savannah suffered through major fires in 1796 and 1820, a virulent outbreak of yellow fever, the occupation of enemy forces during the American Revolution and the Civil War and the wrath of boll weevils, which all but destroyed the state's cotton crop and economy on the eve of the Great Depression. Each time, the city and its hardy inhabitants bounced back economically, culturally and aesthetically, maintaining the charm and historical significance that draws millions of visitors each year. "Oglethorpe designed America's first planned city with wide-open streets..."
Many of them get around Savannah the same way people did nearly three centuries ago – on foot. 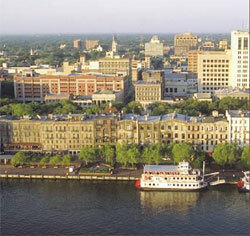 There's good reason Walking magazine has cited Savannah among the "Top 10 Walking Cities" in America. The Meeting District downtown is home to 17 hotels, and most are near fine restaurants, entertainment and night life. For those who choose not to walk, pedicabs, limousines, trolley cars and river ferries are readily available. Savannah's Historic District, a National Historic Landmark, features many restored buildings, including The Pirates' House, an inn mentioned in Robert Louis Stevenson's "Treasure Island"; The Herb House, the oldest building in Georgia; The Pink House, the site of Georgia's first bank; and the birthplace of Juliette Gordon Low, founder of the Girl Scouts of the U.S.A. Among Savannah's restored churches are the Lutheran Church of the Ascension; the Independent Presbyterian Church; the Cathedral of St. John the Baptist, one of the largest Roman Catholic churches in the South; the First African Baptist Church; and Temple Mickeve Israel, the third oldest synagogue in America.